The new inductive Factor 1 full metal sensors in M18 housings from Balluff thank their existence to a new patented technology, and feature the highest function security no matter how harsh the environment. 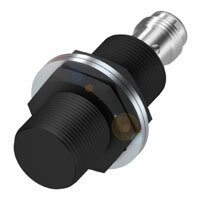 With full stainless IP68 housings they are outstanding for detecting changing objects (steel, aluminum, copper, brass etc.) with no difference in switching distance (no reduction factor). They remain extremely reliable even in direct contact with the detection object. Because the sensing surface is designed for impacts as well as mechanical loads and abrasive media. The Factor 1 full metal sensors have an extended temperature range and are magnetic field immune, meaning they are unaffected by strong electromagnetic fields such as found in induction hardening or welding environments. With the optional ceramic coating they also withstand weld splatter with no problem.